You can expect a change of fortune to your benefit. Time to use commonsense in relation to finances. You may be juggling them at this time – so be practical and watch your priorities. You will be able to cope with the financial see saw through the commonsense approach. Expect good news and small amounts of money – (small sums or a gift). If you have felt things haven't been going your way – then stress less as things are about to turn around. 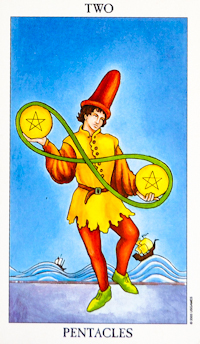 At the same time – this card indicates a juggling of the finances and you may have been “robbing peter to pay Paul”. Basically this means a financial overextension and you are taking from one account say to pay a credit card bill and then living off the credit until the next payment comes in. IT can be quite stressful and impact adversely on emotional and psychological well being. A lack of money and careless use of your credit and finances. You may start to feel financially overwhelmed. Work on getting your finances and self in order as disorganisation is creating chaos in your life. Try thinking of positive alternatives within your day to day routine. Try not to let changes up set you as it is important to maintain harmony – no use making things worse by holding a negative attitude. These situations are temporary, try and stay positive. You may start having back and muscle pain due to tension. If health is an issue – visit the doctor or a naturopath for advice. Try taking a relaxing walk and doing some destress exercises. When this card arrives in the present position – it shows that now is a time to really pay attention to your finances. Focus on catering to needs as opposed to wants. Try manifestation techniques, and work on maintaining your personal energy through distressing –mindful meditations or chakra balancing meditations. Spend some time outside. Focus also on gratitude - make it a daily task to in the morning nad evening to count the blessings.. dirty dishes means that you have been blessed to have food on the table. The more blessings we acknowledge – energetically the more we draw to us. Also keep the energy of reception open through the practise of gifting (in balance), some of the Asian countries practise tithe for example. You don’t have to do that, but if you see an opportunity to gift to another person in need (perhaps a busker) then drop a few coins in to help them on their way and to keep your own energy open.. keep the energy of prosperity flowing. If you like crystals – pop some tigers eye into your wallet, to focus the intent to draw prosperity and abundance toward you.